2010 Starts in a good way! We closed the old year and brought in the new year with a few heart-opening and well attended events…. Our annual Winter Solstice Celebration was the best ever–beautiful songs from Lorraine Bayes and the Sacred Fire Choir, the home-grown shadow puppet show “Raven Steals back the light!” written by friend & artist Craig Spencer, enacted with Therese, Tere and Connie of the Groves. We sang, we danced, we laughed, we ate, we sat in darkness and made prayers. On New Years day we held our annual sweatlodge, a full lodge with strong prayers. 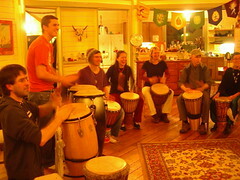 The next day, we ushered the new year in with drumming and dancing–WOO HOO! As you can see from this photo–we were having FUN! The calendar for 2010 is getting fleshed out, I think I’ve got most of it up to date now and most of the hot-link glitches on various pages fixed finally. We look forward to a great year here! Mostly we truly hope that the work we do here at the Groves to weave together community in healing and heart-opening ways helps bring about a more peaceful world for all of us two-leggeds around the planet. May the earth get greener this year, the trees grow taller, people’s hearts flourish. This entry was posted in News on January 12, 2010 by theresecharvet.